Expa / IGDA Finland Jyväskylä Hub Monthly Gathering 23rd April 2019. Gathering place @ Bar Katse 6 pm - 9 pm. The Event is Free and open for all! Also "Open mic" & #DemoCornerJKL available. Welcome to IGDA Finland Turku Hub April Gathering with BugByte team! That is not all! We will also have the game available to play before anyone else! See you all on Wednesday 24th of April from 17:00 at Saaristobaari! Welcome to Kotka Hubs May Gathering! Held at Pub Albert in the Kotka center! After-party is held by Kuura Playhouse at their sauna place in Karhula, everyone is welcome to join there also! Bring your own drinks and towel! 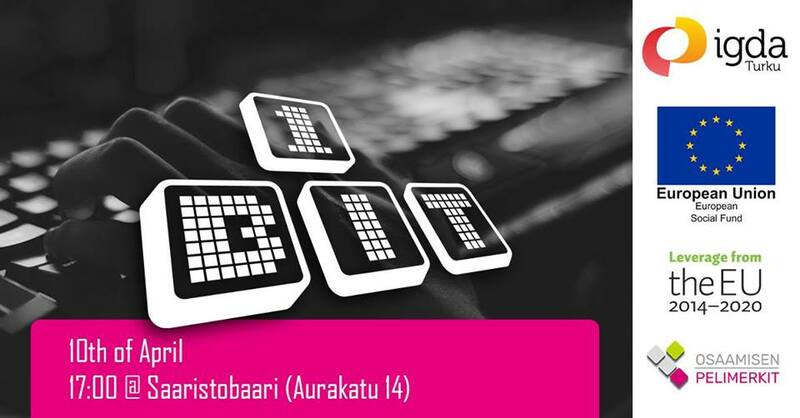 Welcome to IGDA Finland Turku Hub gathering with Bit1 student game competition. PreBit Turku is a preliminary competition where the judges will select top three games to represent Turku in the main event of Bit1. Bit1 finals will be on May 2019 in Tampere where the best student game of the year will be selected. What is the situation of the Finnish Game Industry? What are the salaries? Do people crunch? Let’s talk about hot topics and lift the cat on the table. Top speakers and top hosts! 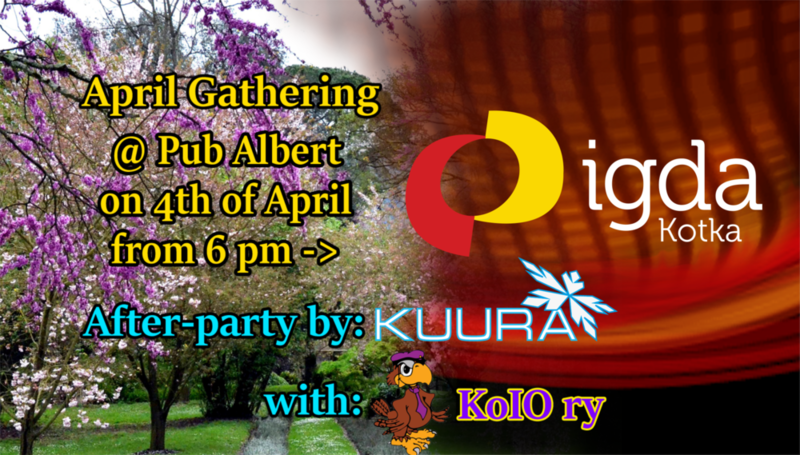 Kotka Hub is having its April gathering on the 4th of April from 6 PM onwards at Pub Albert! 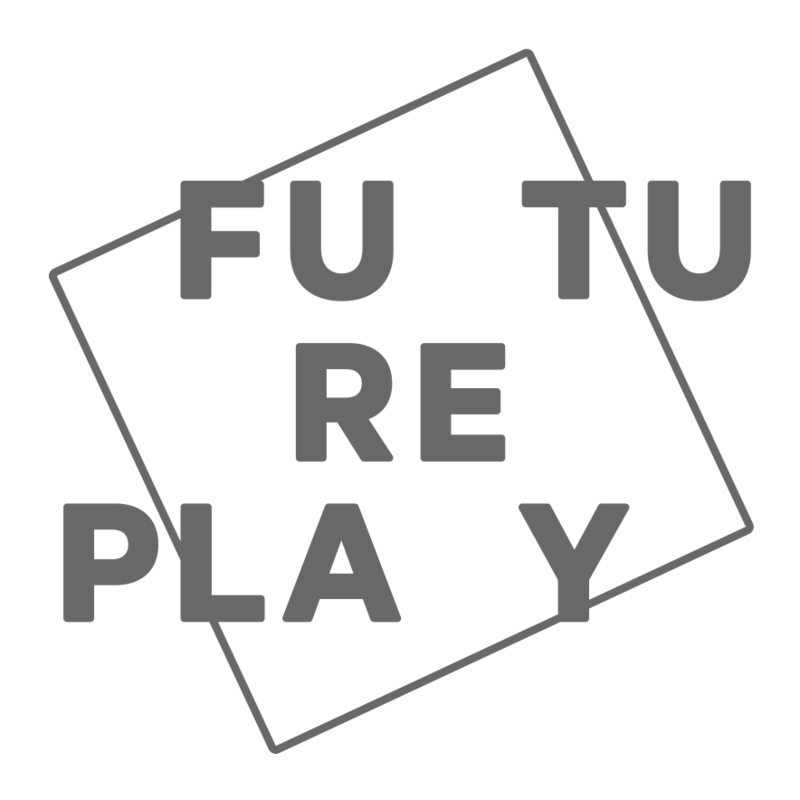 After-party is hosted by Kuura Playhouse at their sauna place! We will have the after-party together with KoIO ry! Recommended that you bring your own drinks, towel and maybe swim wear for the After-party! 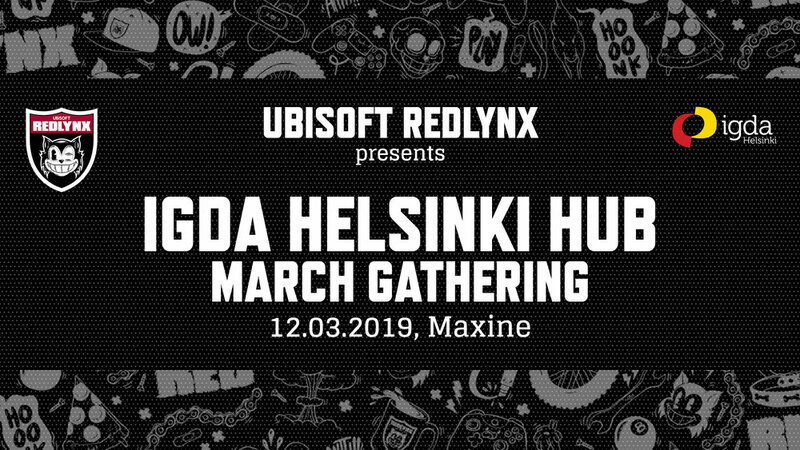 Expa / IGDA Finland Jyväskylä Hub Monthly Gathering 26th March 2019. Gathering place @ Bar Katse 6 pm - 9 pm. Ubisoft RedLynx is a multiplatform game development studio located in Helsinki. Along with the hugely popular Trials series, we have developed and published more than 100 games and we are a passionate team of over 140 people of 24 different nationalities. As one of the biggest and oldest game studios in Finland, we focus on surprising people with the unexpected and creating impactful game experiences that stand the test of time. With Trials Rising the development teams at Ubisoft RedLynx and Ubisoft Kiev worked closely with the community to make the best Trials game to date. This talk will focus on how the development team worked together with the community, what practices were used and how it all came together. Julius is a colorful and smile infused game producer who is currently working on Trials Rising at Ubisoft RedLynx. He’s worked on games ranging from small to big, from mobile F2P to console AAA, and during his time at Ubisoft he’s previously worked on Steep and Trials of the Blood Dragon. If you ever need to spot Julius in a crowd, look for the big hair and colorful socks. In this presentation, Roland will share some of the decisions made bringing South Park to the small screen in South Park Phone Destroyer. Topics include the process of replicating the world of South Park while also supporting the gameplay, the tech used to build the game, and the processes necessary to support the live TV show. Originally having started as a console Graphics Programmer in the industry, Roland is the Technical Director, Mobile at RedLynx, and has worked on games such as Trials Frontier and South Park Phone Destroyer. Far from his German home, he enjoys long summer days and the Finnish sauna culture. He plays a SciFi/Adventure deck. Join local game developers and game dev students for couple of drinks and some food at the Pub Albert in the middle of Kotka! After-party is hosted at Kuura Playhouse - bring your own towel if you want to do sauna & swimming! 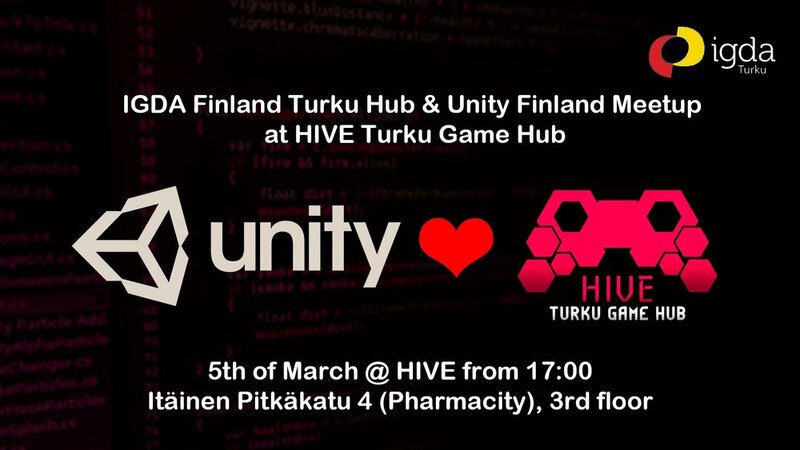 The event will take place 5th of March from 17:00 at The HIVE - Turku Game Hub (address: Itäinen Pitkäkatu 4 / Pharmacity, 3rd floor). Expa / IGDA Finland Jyväskylä Hub Monthly Gathering 26th Feb 2019. Gathering place @ Bar Katse 6 pm - 9 pm. 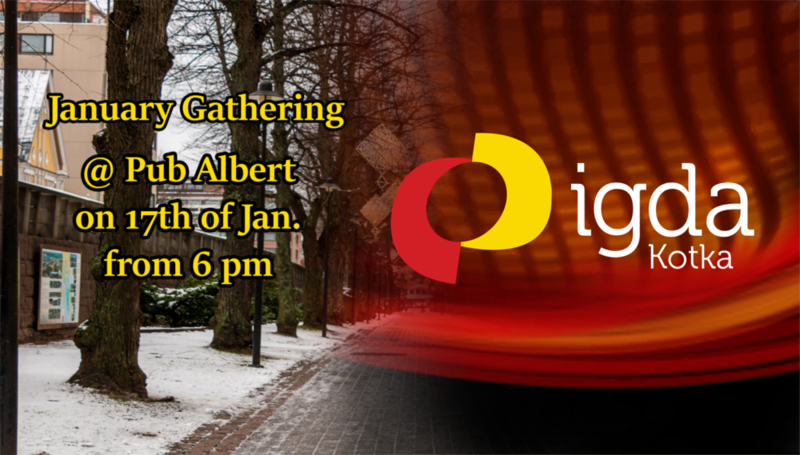 Welcome to IGDA Finland Turku Hub February gathering! 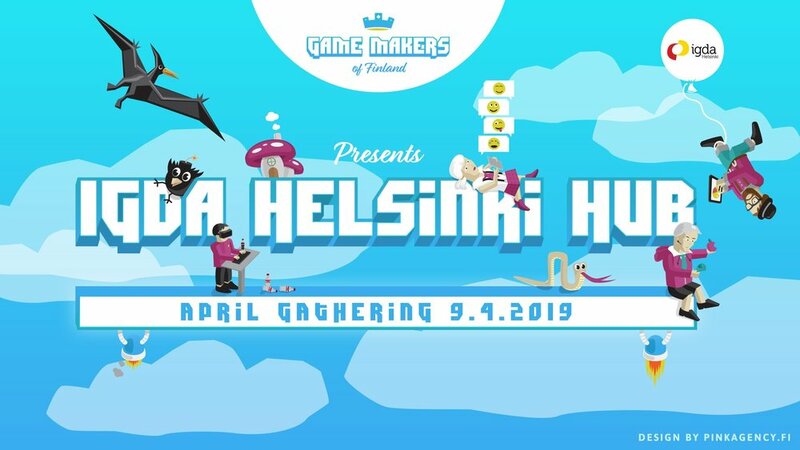 Join the IGDA Finland Helsinki Hub and Finnish Game Jam for a night of games created at Finnish Game Jam 2019, and a seminar on the theme of game jamming! Please note: This is not a sponsored event, the cloakroom at Maxine will charge 2,50€ from each visitor. Please note that you need to be at least 18 years old to attend. This is not a sponsored event, the cloakroom at Maxine will charge 2,50€ from each visitor. Winter has come! Snow exists! Welcome to the Kotka Hubs February Gathering at the Pub Albert on the 7th of February from 6PM onwards! We are planning to have a demo-corner type of thingy where people can showcase their jam games made during the Global Game Jam 2019! Showcase starts at 6:30 PM and at 8:30 PM we start to head to the after-party place - so people who need to visit the store for drinks can do so before the stores close up. After-party will be held at the Kuura Sauna space. Please note if you are coming to the After-party to prepare yourself with towel and maybe your own drinks if you are drinking. Expa / IGDA Finland Jyväskylä Hub Monthly Gathering 29th January 2019. Gathering place @ Bar Katse 6 pm - 9 pm. - Tape Babes marketing material showcase! More speaker info coming soon! The seminar will take place at Aalto University School of Business (Runeberginkatu 14-16, 00100 Helsinki). Please note you need to register for the seminar on Eventbrite as seating is limited (you do not need to register for the gathering in Maxine at 19:00). The Fortnite Battle Royale takes the gameplay of battle royale games and adds action-building elements unique to Fortnite. Enter a 100-player PvP world where you’ll locate weapons and supplies, destroy enemy cover, drop traps, and build your way to victory. Welcome to this years first gathering at Pub Albert in Kotka! Join us for couple drinks and chat with local game developers and students! Welcome to IGDA Finland Turku Hub January gathering with MiTale! MiTale is game development company from Turku established in late 2016 by group of local developers passionate about interactive storytelling and serious games! They are new addition to the growing gaming industry in South-West Finland and they wish to share their story with you at our upcoming gathering. 15th of January 2019 from 17:00 in Saaristobaari! Our pikkujoulu-gathering on 18th of December @Saikku is filled with Christmas spirit and gratitude! Instead of presents, we urge you to bring your DEMOs - so we can spread out the joy of awesome projects! In addition to the demos there will be cookies and snacks and drinks available! Collecting names mainly to get idea how many people are coming. It's Xmas time in IGDA Kotka! Welcome to celebrate the holidays and the soon ending year! Join us first at the Pub Albert for xmas themed gathering. Some drinks sponsored. Xmas themed clothing is recommended but not necessary. And then to the After Party at the Kuura Playhouse sauna space. Drinks will be provided at the after party. Turku Hub - XMAS party! Our Xmas party will take place on 12th of December from 17:00 at Saaristobaari (Aurakatu 14). This year we will have teams from Hive – Turku Game Hub as well as open mic for all other developers to tell what they have been working on during 2018! The first 500 people attending the event will receive a coupon which they can exchange for a Veikkaus-themed lootbox upon leaving the event! Some food will also be served around 19:00 once the seminar ends and the gathering begins. Veikkaus is the Finnish national gambling company with over 2000 employees working across Finland. Inside this giant there is an agile unit, the Veikkaus Game Studio – a game development studio of 45 creative and enthusiastic game development professionals. The game studio produces online and land-based slot games and e-Instas (online instant win games) to Finnish markets, all together around 15 game releases a year. Veikkaus are also actively expanding their game portfolio with new types of games and innovations. This branching out requires networking with new business partners and looking into new business models. The team at Veikkaus feels that they can find the best partners for this work right here within the Finnish game development scene! The development philosophy of Veikkaus Game Studio is simple; “Awesome teams make awesome games”. They strongly believe in self-driven teams and cultivating teamwork is in the core of their everyday work. Within their flat organization the development teams and individuals are given the freedom and responsibility to innovate, develop and have fun in the way they see fit. This has resulted in better games, higher development efficiency and better returns. Henri is a game development veteran with nine years of industry experience. His background is in mobile F2P games, working mostly in producer roles. Before Henri started as studio head at Veikkaus Game Studio he was an Executive Producer at Nitro Games, working on multiple game projects with multiple external partners, including Wargaming and Netmarble. Karoliina has worked with game design in simulation games for seven years but is currently pursuing the trade of game producing. Karoliina has background in QA, a degree in graphic design and a passion for academic game studies. She has been working as a Game Producer at Veikkaus Game Studio since March 2018. Ilkka has a long and diverse history in the Finnish gambling scene, working as a croupier before joining the team at Veikkaus Game Studio as a Producer three and a half years ago. During his time at the studio, he has been worked on various titles, including Kultaranta and Kulta-Jaska 2. Ilkka started his path as a Game Producer at Kajaani University of Applied Sciences and has a passion for supporting the Finnish game development community any way he can. Sakari is a seasoned game art veteran with experience in most forms of digital media communication. He has established his credentials in advertising, tv & film, illustration, motion graphics and animation before joining Veikkaus Game Studio. He has worked on numerous Veikkaus game titles as a game artist and presently acts as a Lead Game Artist at Veikkaus Game Studio. Senja has worked in the gambling industry for over eight years, and she is proud to have been a part of modernizing Veikkaus' slot machine games. With multiple titles under her belt, her work includes many popular games such as Emma and Saaga. As a Senior Game Artist on an agile team, her job is to create and direct art from concept stages to finished product. Henrik Hackenberg has been at Veikkaus for five years and in that time, he has participated in creating art for 11 released projects. Henrik is a true generalist at heart and enjoys working in both 2D and 3D and happily contributes in a variety of sub-fields such animation, effects and compositing. Ho-ho-ho! We are already full of Christmas spirit so come and join our little Christmas party where we will play board games, try some game demos and socialize with discussions about and around games. You will be in for surprises during the evening! The event starts at 17:00 @ Ritz. No registration necessary. PS. We will give out free drink vouchers for the early arrivers! Ho-ho-ho! Olemme jo joulutunnelmissa, joten osallistu kanssamme juhlimaan pikkujouluja, joissa pelaamme lautapelejä, testaamme pelidemoja ja jutustelemme leppoisasti peleistä ja kaikkea sen ympäriltä. Luvassa yllätyksiä illan aikana! Tapahtuma alkaa 17:00 @ Ritz. Rekisteröityminen ei tarpeellista. PS. Jaamme ilmaisia drinkkilippuja ensimmäisille tulijoille! Ho-ho-ho! Vi har redan julstämning så kom och delta med i firandet på vår lilla julfest, var vi kommer att spela bordsspel, testa speldemon och diskutera om och kring spel. Kvällen kommer att vara fylld av överraskningar! Evenemanget börjar 17:00 @ Ritz. Ingen registrering nödvändig. PS. Vi delar ut gratis drinkbiljetter till de första anländare! Turku Hub - November Gathering with Platonic Partnership! Welcome to IGDA Finland Turku Hub November gathering with Platonic Partnership! See you all on the 20th of November from 17:00 at Saaristobaari. This time in our gathering we will discuss about marketing of games, particularly advertising through the use of the Reddit platform. There will be time for socializing and networking after the main event, which is also followed by O’Malleys “Game Night” where we will play board-, card- and digital games. After-party to be had at Nitro Games sauna @Sapokan Sauna! Come there too and meet more people maybe!